Beginning in February 2013, researchers at the Institute for Immigration Research (IIR) at George Mason University began tracking the national immigration reform conversation on Twitter. Our view: Twitter would be one of several social media venues where the evolving immigration reform debate could be tracked and analyzed. 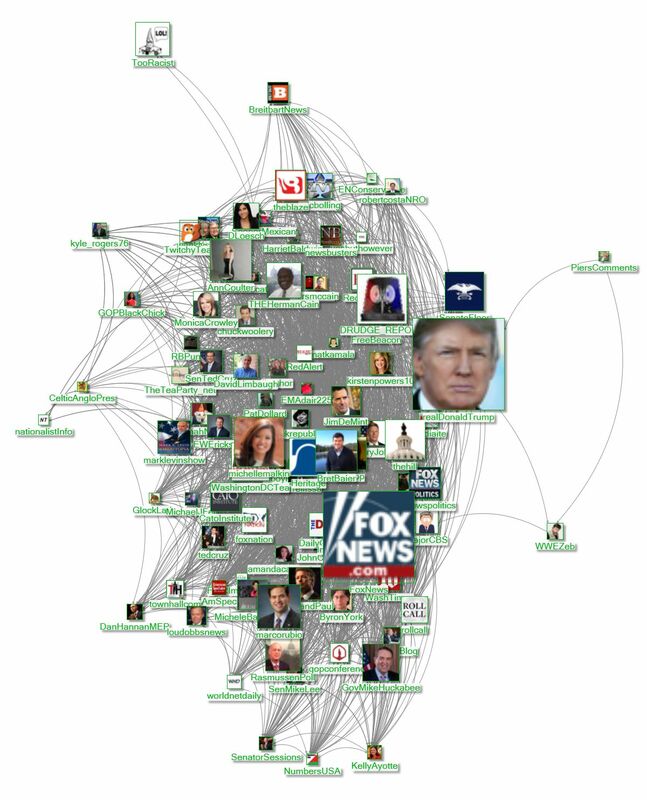 Since then, using DiscoverText and NodeXL, two different data mining applications, we've collected nearly 3 million tweets containing the word "immigration." With a lot of data at our fingertips, we sought to identify who were the most influential tweeters about immigration reform, and how they interacted with one another. To do this, we identified the most influential daily tweeters about immigration between March and May 2013, as assessed by betweenness centrality -- one of several important statistical measurements of influence within a social network. We then looked at their connections with one another as of June 2013, using a Clauset-Newman-Moore algorithm -- a complex formula that sorts similar actors in a network into groups. 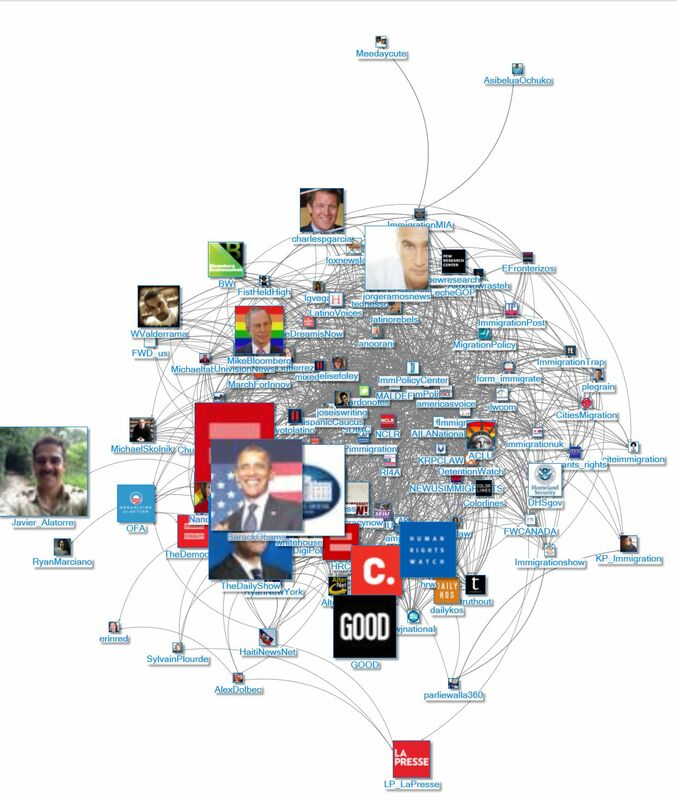 Below we reveal and describe five clusters of immigration reform "power tweeters." In a related post, "Immigration Reform Power Tweeters: Part 2," we delve further into the data to note some of the major similarities and differences between these clusters. 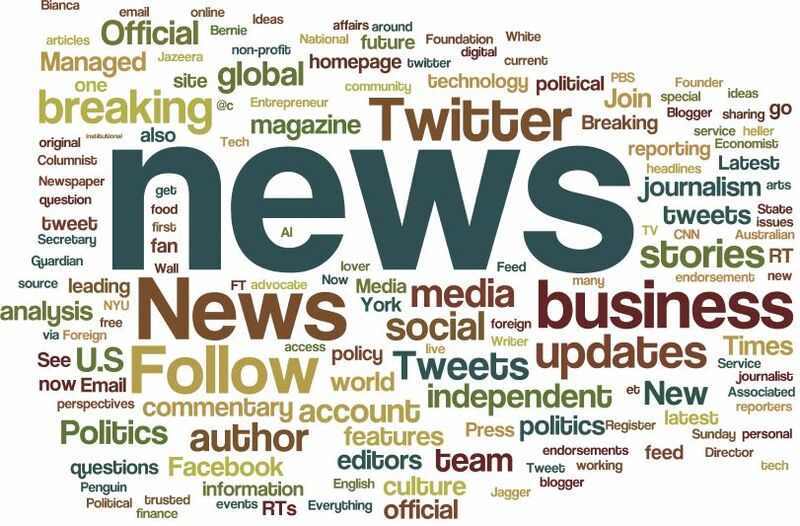 The first cluster, pictured in the image below, is dominated by mainstream news organizations. Also included in this group are significant numbers of celebrities and influential online commentators. John McCain, a well-known, pro-reform Republican, is the only politician included. The primary shared attribute for members of this group is their influence in a broad range of topics. Not all of them tweet very frequently about immigration reform -- but when they do, their tweets are particularly influential, because these tweeters have many Twitter followers, and therefore have high visibility. Because of this, they are influential no matter what they tweet about. 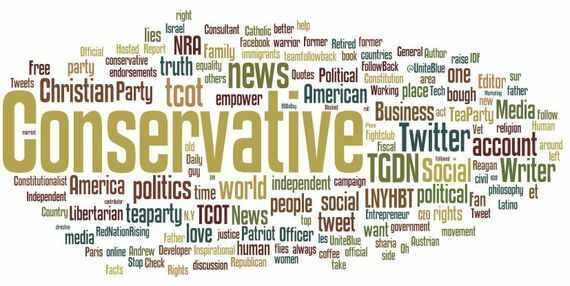 To better understand the composition of this group, we created a word cloud based on the words these tweeters use in their Twitter profiles. 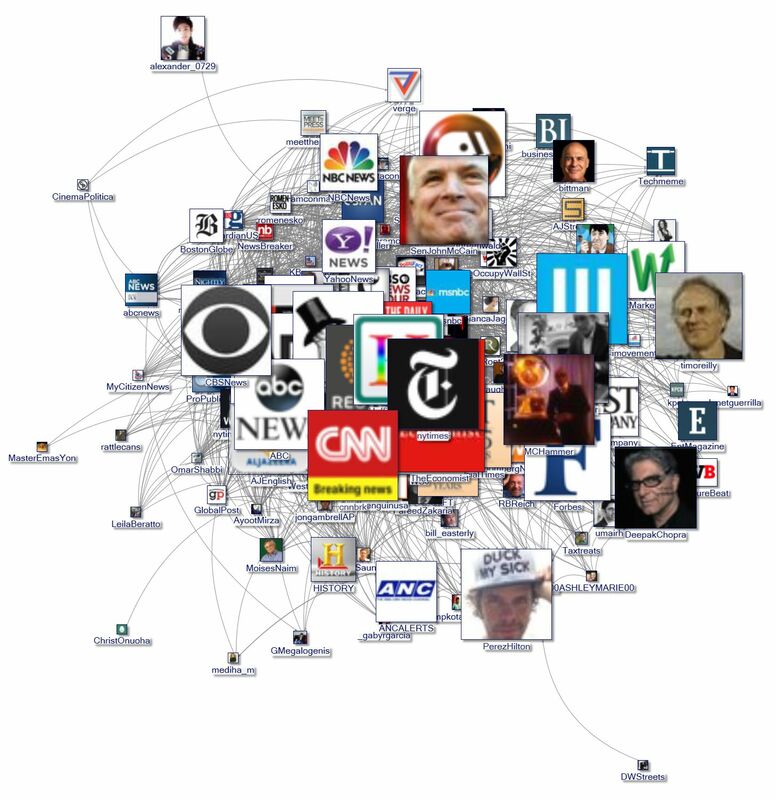 Most describe themselves as "news" sources on a wide variety of topics. Note that the word "immigration" does not stand out in these tweeters' profiles. The second group is dominated by pro-reform individuals and organizations. These include organizations that embrace a variety of other progressive causes, such as the Human Rights Watch, as well as several that specialize in immigration only. Although they tend to have fewer followers overall (as indicated by the smaller images in the figure below), they are influential tweeters about immigration because of their greater focus on that issue. Extremely popular figures, such as President Obama, are the exception in this group. The word cloud based on these tweeters' profiles makes clear that many of them are especially concerned with immigration issues. The third group was the smallest of the five clusters. 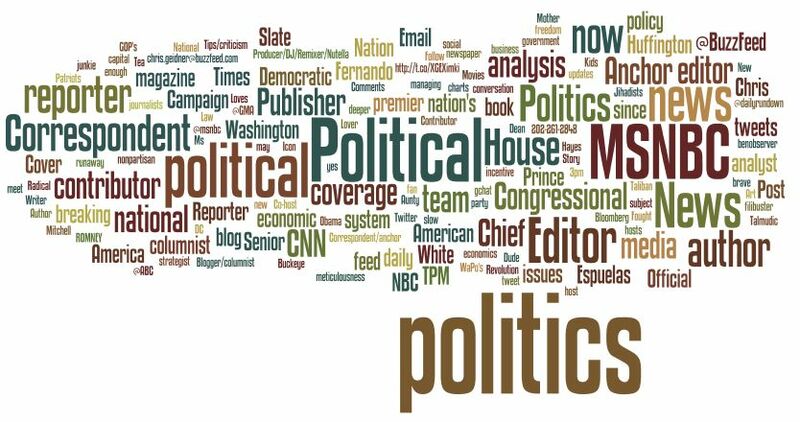 It consists of left-leaning news organizations, like NPR and Mother Jones; left-leaning bloggers and online journalists, like Markos Moulitsas, Josh Marshall, and Matty Iglesias; and left-leaning mainstream media commentators, like George Stephanopoulos, Joe Trippi, and Donna Brazile. These tweeters tend not to explicitly highlight their political orientation in their Twitter profiles. Most identify themselves as political commentators, but most do not associate their commentary with a particular political agenda. This group is a "who's who" of influential conservatives in the media and in Congress: Donald Trump, Marco Rubio, Michelle Malkin, Mike Huckabee, and Tom Coburn are just some of the individuals central to this network. Influential organizations, including Fox News, the Drudge Report, and the Heritage Foundation are also prominent members of this group. Unlike the left-leaning media, the members of this group tend not to be shy about making their conservative political views explicit in their Twitter profiles. 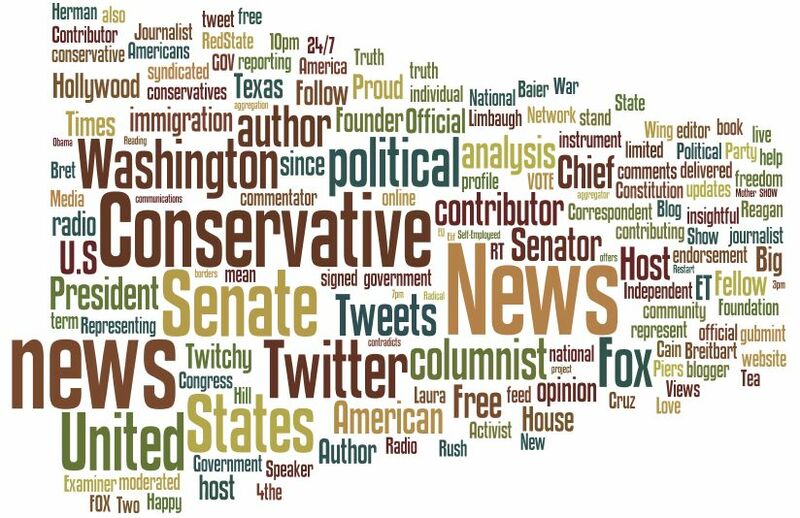 The final cluster we found in our analysis of immigration related tweets consists of conservatives who also identify or sympathize with the Tea Party. Unlike the other clusters, this one consists almost entirely of individuals. Furthermore, the individuals aren't affiliated with any prominent organizations: they are "ordinary" Americans. Cluster 2, the pro-reform group, has a significant minority of tweeters who fit this description--but Cluster 5 is dominated by them. 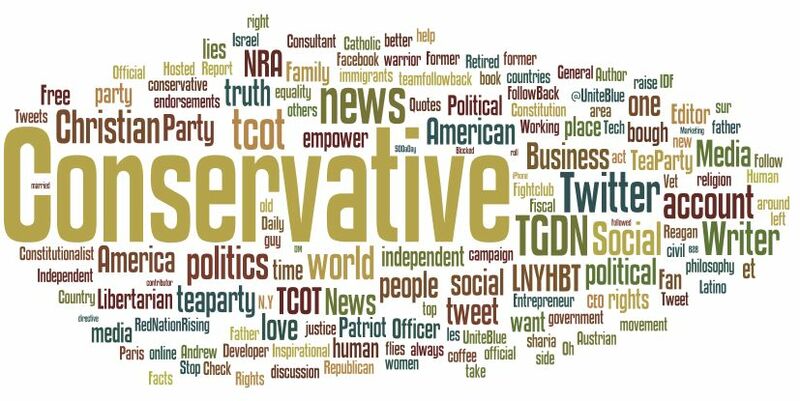 Moreover, the word cloud for this group reveals its members are even more adamant about touting their conservative viewpoint in their Twitter profiles. What can we learn from these clusters? Not surprisingly, we see that political affiliation is a major feature that distinguishes clusters of power tweeters from one another. There are two progressive groups, two conservative groups, and a mainstream group that, depending upon whom you ask, represents a mix of viewpoints or is biased one way or the other. The second major feature appears to be the presence or absence of institutional affiliations. The reformer group is the most diverse in this regard, with a mix of Democratic politicians, progressive political organizations, and unaffiliated individuals passionate about immigration reform. Three of the other four groups, however, are dominated by institutions, or individuals connected to these institutions (e.g., journalists and politicians). By contrast, the Tea Party power tweeters are distinctive in that they are almost all individuals unaffiliated with any particular institution. Does this mean that Twitter is primarily a social media platform dominated by elites, or that the Tea Party has harnessed Twitter in a way that other groups of individuals have not? Not necessarily. This particular data just looks at differences among the most influential immigration tweeters. It doesn't address the many thousands of other immigration tweeters, how these tweeting masses interact with the most influential tweeters, or how they interact with each other. But other questions remain. 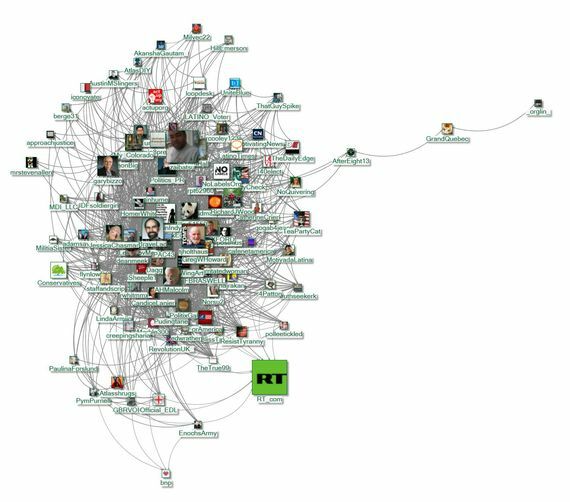 Have each of these clusters attained their influence on Twitter in the same way? Do one or more of these clusters have more influence on the conversation than the others? And what about the connections between these clusters--are they all following and interacting with one another, or do they largely exist in their own little bubbles? We explore the answers to these questions in Part 2. Randy Lynn is a Ph.D. candidate in sociology and a graduate fellow at the Institute for Immigration Research at George Mason University.